A formal complaint from an Anston resident has been picked up by the Dinnington Guardian. Essentially Anston Parish meetings are a mess. We have the borough big guns of Jo Burton, Judy Dalton and Dominic Beck aided by the grumpy old men brigade up against the few independents on the Council who do their best to hold the rest to account but are hampered by lack of numbers. All other Cllrs act as cannon fodder. The only support the Council can usually conjure up at meetings are individuals who just happen to work for them. This entry was posted in Anston Parish Council and tagged Anston, Anston Parish Council, Beck, Parish Council, Rotherham Council on April 27, 2013 by lovedinnington. Can I through your site, dissociate myself from the type of discusting behaviour, that is being throw at Members of the Public by Labour Members of the Parish Council. Abusing Members of the Public is unacceptable and against the Code of Coduct. Cllr Stonebridge was perfectly aware that a complaint had already been made against Cllr St John,( for his previous outburst at a Member of the Public), He knew perfectly well what he was saying, he was aware that his comments would prevoke a reaction, and when challanged by a Member of the Public (whom he has verbally abused before) he carried on with his comments. 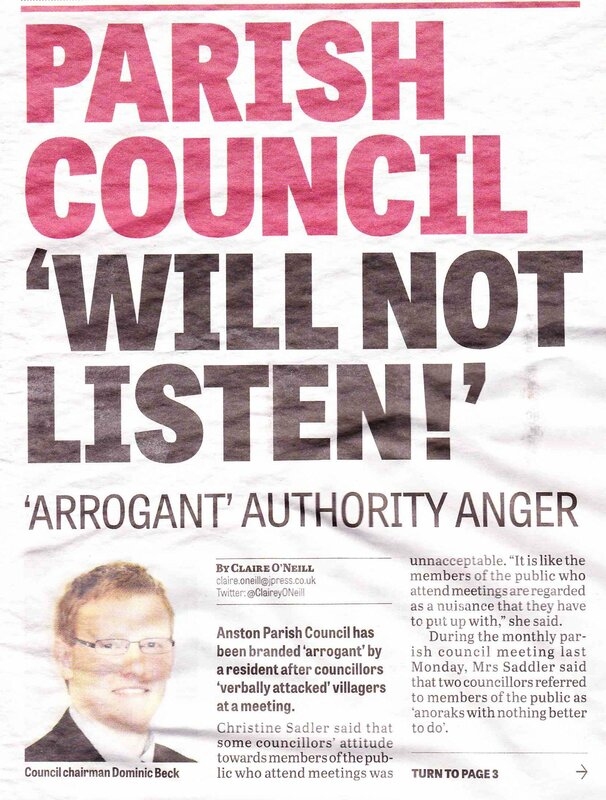 I am sure that most of the Independent Members of the Parish Council also agree with me that this Cllr should not only apologise, but resign from the Council. We have already had a situation where Cllr St John has ” verbally attacked” members of the public and not only refused to say sorry, but also refused to stand down. Shame on them both. If the abuse of the public is bad enough, lets look at the reaction of their fellow Party Members, Not one of the Labour group on the Parish Council has the guts to stand up and condem their actions. They just sit there hoping no one will notice. Well the public do notice and are voicing their discontent. To sit and do nothing while their friends make unacceptable verbal comments is just as bad as saying them. Its all a question of integrety, If Magistrates, School Teachers, School Governers and Charity trustees are not going to stand up and condem their actions then they themselves should go. Now for the best bit, on the two separate occasions that abuse of the public has occurred, Cllr Beck was the Chairman, on both occasions, HE SAT AND DID NOTHING, he sat and watched while his friends made vile comments. Cllr Beck is also a RMBC Cllr who sits on the STANDARDS COMMITTEE in judgement of others, Standards, what Standards. He also, will not condem the actions of these two, and his “quotes” in the Guardian about the Public and the Council working together is so sickening its laughable. In his response he is implying that its not the Council at fault but seems to be putting the blame on the Public. Note, not a word about the two Cllrs involved, Its time he was accountable for his actions and he should follow the other two, out of the door. The quotes in the Guardian are those of Cllr Beck himself, he did not counsult other Parish Cllrs before he spoke to the Paper. The Parish Council is there to represent the Public, not to abuse them, its there to work with the Public, not to shout at them, But here is the most ironic thing of this whole issue, Cllr Stonebridge represents the Chesterfield Canal Trust, and he was more than likely abusing the very people who give funding to his cause, nice one. I condem the abuse and will not be a party to it . 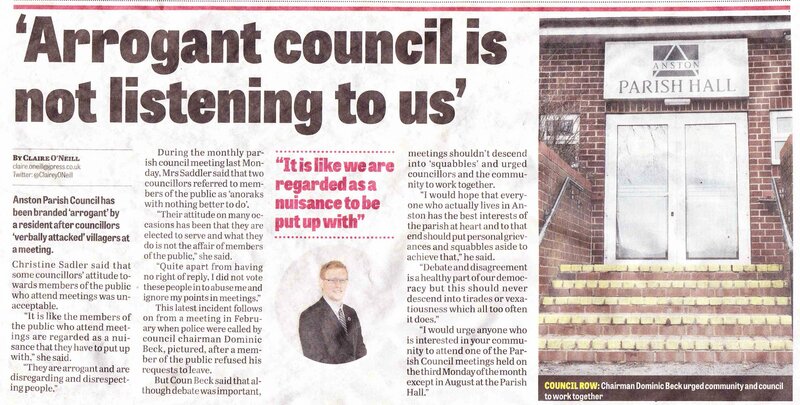 I think we need more members of the public to turn up to the meetings, that’s how you start to get real scrutiny of what the council is up to, when ordinary people are there to challenge decisions. 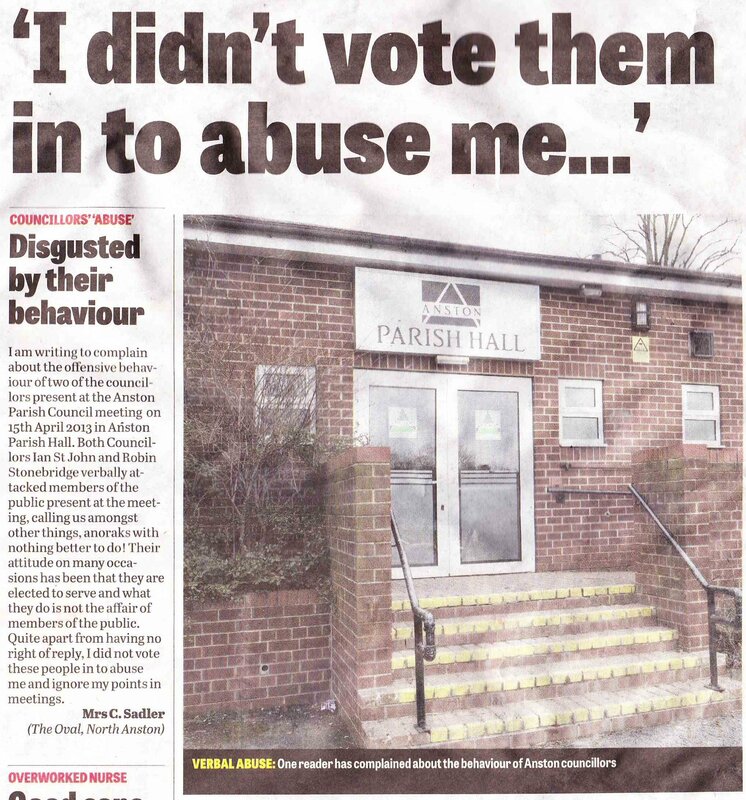 The Guardian says the public need to respect the Parish council as much as the Parish council respects the public, accusing the public of behaving in a disrespectful was to the council. However at the question time at the end of the rearranged meeting with a large public in attendance, the Chairman confirmed to the public that there would be a vote on the core strategy at the next meeting, this never happened and in my book I class that as a large untruth. It is the type of thing one comes to expect of the political elite, E.g Cameron at the last election I will give you a vote on the EU if I am elected, but once in power he says it will not be possible to give a vote. If people are lied to at the ballot box, what are they expected to do. I think it is time for “Evolution”.